Given the plethora of attention and literature the topic of distribution channels and strategies to reach underserved income segments and remote geographies attracts, one would think we would be well on our way to solving most of these logistical challenges. However, for those of us at Business Innovation Facility working directly with the companies managing these problems, it’s clear that most cookie-cutter solutions to distribution do not work. Regardless of whether they are selling energy, health care, education, water sanitation systems or other products and services, companies often either give up or get frustrated after repeated experiments with multiple pilot programs that fail to show adequate success. Even when pilots do succeed, many companies run into problems when attempting to scale their solutions to larger segments or geographies. Through our engagements in supporting companies facing such challenges, we have found that ‘one size does not fit all’ when it comes to distribution channels. However, when we explored the channels that already serve these underserved markets, we found several opportunities for companies repurpose many of these networks. The solutions that emerged are not obvious upon first glance and are easily overlooked, primarily because they do not fit our traditional assumption of models of distribution channels. In the latest of our ‘Inside Inclusive Business’ series, BIF goes beyond theoretical solutions and focuses on some of the more innovative channel strategies we discovered during our engagement with companies. We found that well-tailored partnerships were the key to almost all successful solutions. This new report, which I co-authored with Rashi Agrawal, senior associate at Intellecap, delves into the choices partners faced and the best ways to select them, and goes beyond looking merely at commercial parameters. In the report, we also identify six steps in utilizing existing distribution infrastructure. As an example, in India, Tata Consultancy Services has developed mKRISHI, a mobile-based personalized service delivery platform for dissemination of information such as latest crop price and weather information to farmers. Initial mKRISHI pilots revealed that while farmers liked the product, a strong local partner was required to provide the agricultural expertise and the physical ‘last mile’ connectivity to the farmer. 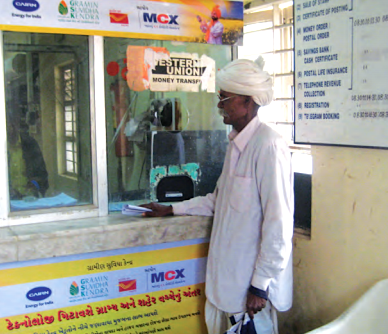 mKRISHI is now partnering with several organizations, including the MCX’s Gramin Suvidha Kendras, that provide coordination services, along with product-bundling that generates demand. We hope you find this document useful. We’d be keen to hear your feedback and experiences in dealing with similar challenges. The Inside Inclusive Business report “Distribution networks to the base of the pyramid” was written by Rashi Agrawal and Nisha Dutt, who work for the Business Innovation Facility in India.